We see a lot of photos and videos on the Internet of parent who seem a bit too casual about allowing their children and dogs to play together in ways that seem dangerous to experienced dog owners and parents. What happens when these dogs finally stand up for themselves? They are all too often given up to animal shelters, marked as aggressive, and euthanized for behaviors and actions that could easily be avoided if the adult humans would simply show some care, concern and respect for the animals and children in their care. In the news in recent weeks we’ve seen both dogs and children loose their lives because of parents and adults who either lack proper education or have poor judgement. If you have children and dogs in your home, take a moment and make sure that you are taking the proper precautions to keep everyone safe. We all get busy or distracted but with a few precautions, a little distraction won’t lead to disaster. 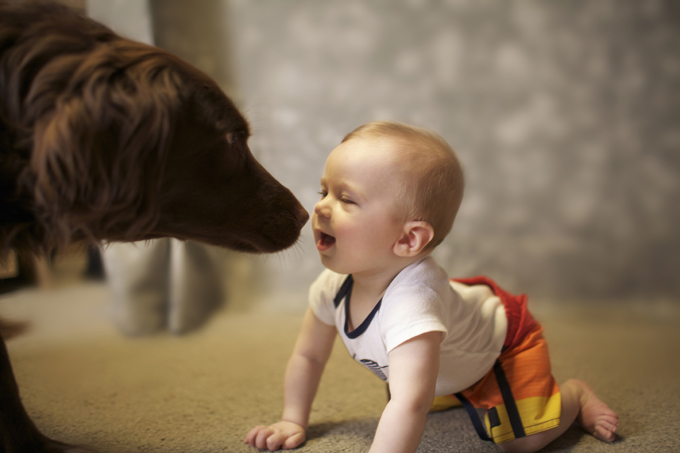 Here are 10 tips that will help to ensure that both your dogs and your children can grow up in the same home: happy, healthy, safe, and without incident. 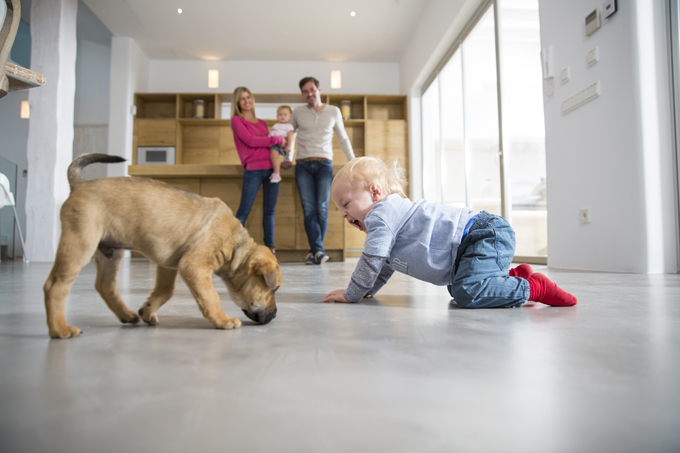 If your dog is outside getting some fresh air, that’s a great opportunity for your baby to crawl around on the floor but when your dog is inside, this can be dangerous. You never know when a frightened or startled dog or baby could react in a way that might cause harm to the other. This is never a good idea. We parents get busy with life, phone, the computer and stop paying attention to what our children and pets are doing. 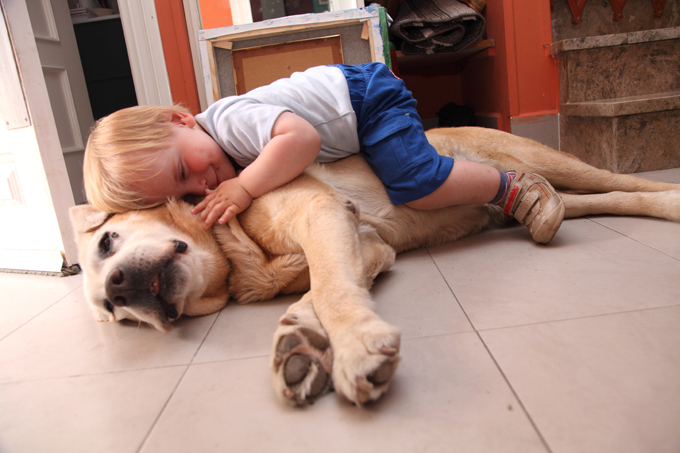 A simple hug from a child can be taken as an act of aggression by a dog. It’s best to always keep your kids within arms reach, even if there’s not a dog around. If your baby starts crawling, you need to follow. Don’t let your child or baby wander around the into rooms where you can’t see them. 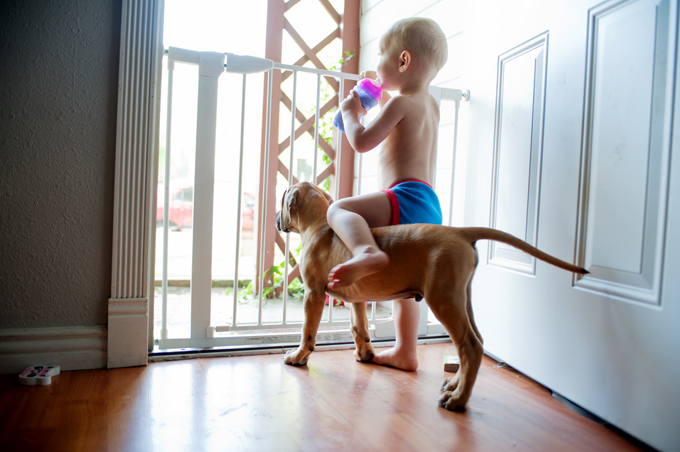 Use child safety gates and locks to keep young children contained and away from your pets or other hazards and dangers. Dogs can be startled in their sleep just like humans. 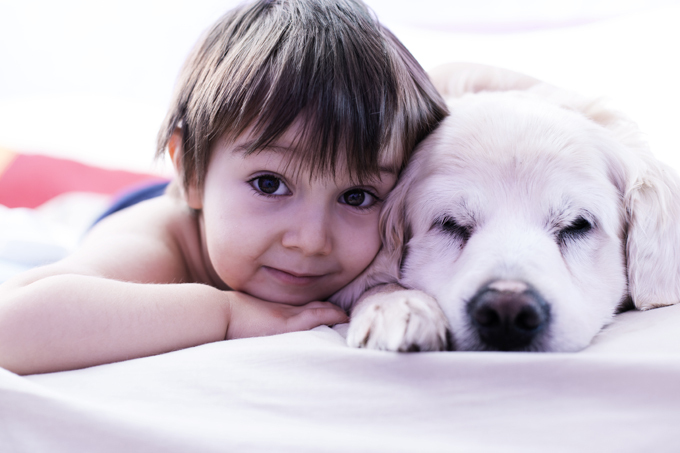 Give your dog a safe and comfortable place to sleep where children can’t startle or disturb them. This is never okay. Children need to be taught from birth that animals are to be treated with kindness and respect. It’s not okay to sit on a dog. This is when things can go very bad. Your kid could get bit your dog’s back could be injured. It’s not a funny photo opportunity. It’s dangerous. Maybe your dog is use to hugs but to most dogs a hug is a sign of aggression and many dogs will react accordingly. Teach your children that they must always ask permission to touch or talk to a dog and they should never, under any circumstance hug a dog. This is how a lot of children end up getting bit. 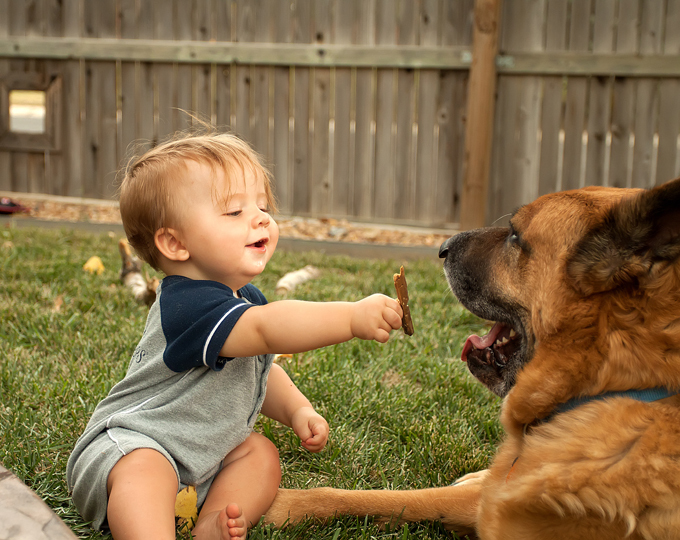 Whether it’s a treat or a toy, children should learn that they should never try to take anything away from a dog. If a dog takes their toy, they should find the nearest adult, report the situation and let the adult handle it. You might enjoy cuddling with your dog and your new baby but this exact scenarios has led to death. It sounds like a lot of fun, but it’s really just not safe. Children are a lot of work but having a child doesn’t mean that your dog should suffer lack of affection. Be sure to treat your dog the same as you always treated him or her before your precious baby was born. 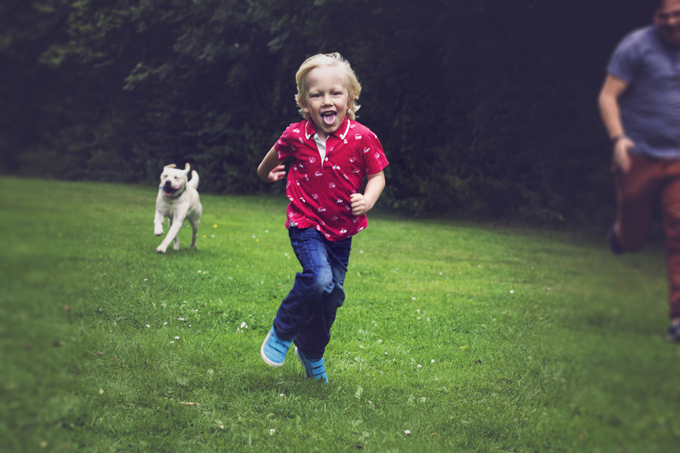 When kids run, dogs love to chase. 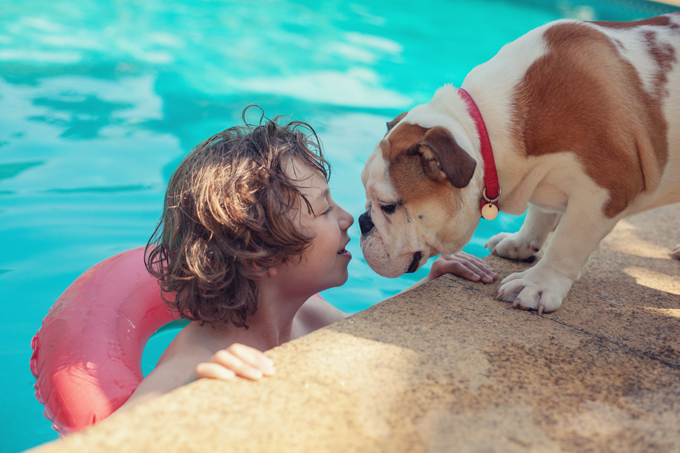 Teach your kids that being around a dog is like being around a swimming pool. It’s safer to walk. Hopefully an adult is nearby to stop any playtime that becomes too rough for your child or your dog. This is not a one way street, if you see your dog exhibiting a behavior that is not okay around children you need to teach them that this is not okay. 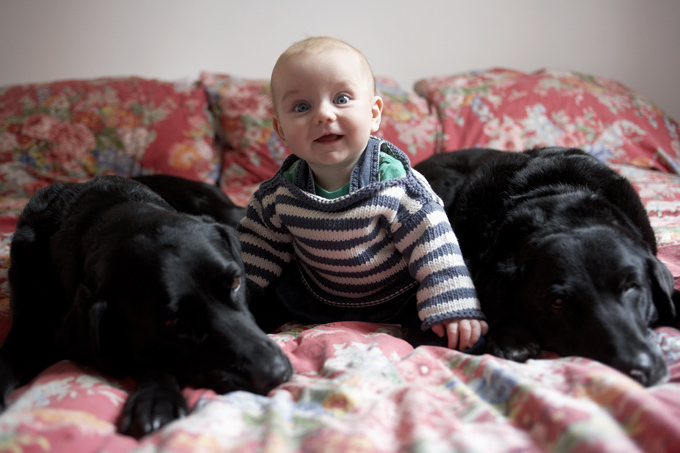 You may need to work with a trainer or put your dog in a bedroom and close the door when children are playing. It’s always better to be safe than sorry. If you are a new parent, do your research, there are many resources online to help you child and dog proof your home and life.